Complete, Year-Round Care For Your Boat! While many marinas keep service staff only during the summer, the typical boating season, we provide a complete, menu of services year-round, to keep your boat in top working condition. All service specialties, not just the basics, are available all year at Hot Springs Marina. This benefits our clients, and also gives us the benefit of working on the same boats year after year, getting to know our clients and our clients’ boats, year-after-year-after-year. Our Service Department operates year round with Yamaha certified technicians to help maintain your boat and motor for fun on the water, not frustration! Service Manager Rick Clark will greet you with a smile and guide you in determining the best way to keeping your boat well maintained and running smoothly. We are an authorized Yamaha service center with quality Yamaha parts and lubricants. We also stock many other brands of parts and accessories for your boating needs. Hot Springs Marina is a dealer and authorized service center for the leading marine manufacturers who trains and certifies our specialists. This ensures our technicians stay abreast of technological advancements in boat care and each manufacturer’s equipment specifications. Having problems with your boat running rough, sluggish or not at all? It could be a “fuel problem” caused by ethanol in the gasoline you are using. Speak to our Service Department today about installation of a special fuel filter which traps the water in the fuel and preserves your engine for longer life. Let our trained mechanics get your boat ready for top performance. 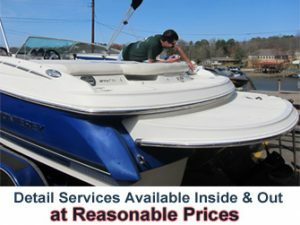 Quality Service for all your boating needs!